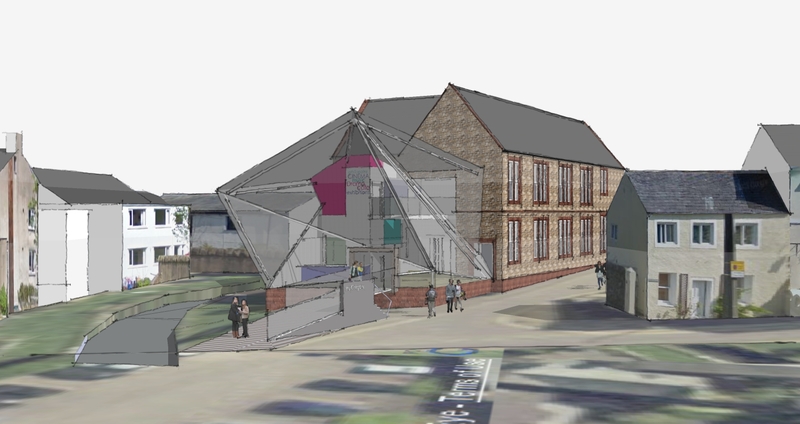 Late last year I was invited to submit proposals for the extension and improvement of The Kirkgate Centre in Cockermouth. For those that don’t know Cockermouth The Kirkgate is a volunteer run arts venue showing a variety of productions and films in what was All Saints School. Collaborating with Hayward Associates I proposed a contemporary solution based on a narrative derived from the process that takes place between stage and audience. Using the architectural metaphor of a cube that starts in its pure form and becomes transformed, open and more complex as it journeys through the building to represent the process of ‘education’ art can deliver. The end result is a multifaceted glass atrium that is open and welcoming to the visitor without masking or hiding the Victorian architecture of the existing building. Sadly, it was too radical and another solution was chosen. Never mind, you can’t win them all! But I hope The Kirkgate remembers that architecture is part of the arts too and plays a very important role in shaping our cultural future. …playing it safe is not what art is about!